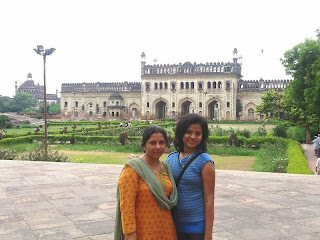 My first visit to Lucknow, "the city of Nawabs" was most memorable. Here are some of the spectacular architectural forms. 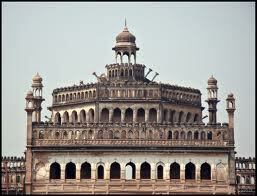 Asaf-ud-Daulah, the fourth Nawab of Awadh made Lucknow the permanent capital. He is credited with its initial beautification and glorification.One of the earliest building and largest one constructed by Asaf-ud-Daulah was the Bara Imambara in 1784.
and could not be identified. Most of those who worked through the night were unskilled workers and the work done was not upto the mark. This sub-standard work was demolished during the day and rebuilt by skilled workers. blocks have been put together with interlocking system of bricks and there has been absolutely no use of girders and beams. The roof stands steady till date without any pillars to support it. The Bara Imambara is known for its incredible maze called Bhool bhulaiya. This is located in the upper floor of the monument. A stairway leads to this level. One can view a scenic panorama of the city from the top of this monument, which is absolutely breath-taking. The Bhool Bhulaiya was constructed to confuse any enemy intruders. It is three storeyed, surrounded with 489 similar galleries, where one can roam endlessly for hours together. This is why it is so mysterious. 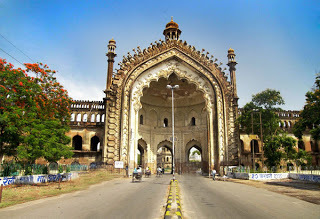 Rumi darwaza: which was built along with Bara Imambara is one of the most beautiful gates in India and worldwide. Nawab Asaf-ud-Daula constructed Rumi Darwaza in 1784 as a part of the 'Food for Work' programme to help financially his subjects who were suffering from a prolonged & severe famine. Chhota Imambara: Chhota Imambara, the Hussainabad Imambara stands to the west of Bara Imambara which was built by Nawab Mohammad Ali Shah. It is more ornate in design with exquisite chandeliers, gilt-edged mirrors,and coloured lamps. A golden dome and fine calligraphy on the exterior of the building makes it a truly exceptional monument of Mughal architecture.